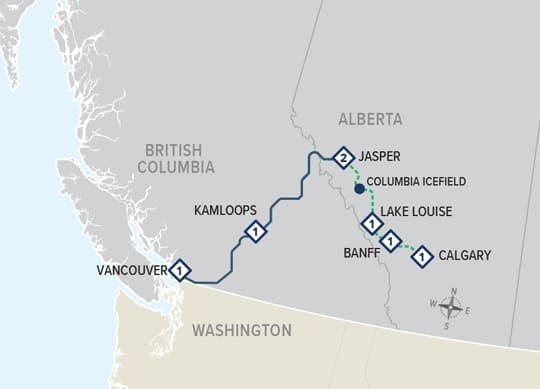 This week long adventure includes two days on the Rocky Mountaineer, four nights in the Canadian Rockies and a five day full-size rental car with unlimited kilometres. 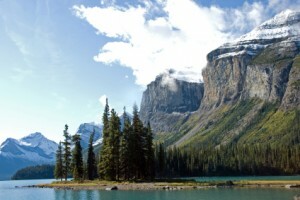 Pick up the car in Jasper, explore the Rockies then drop the car in Calgary before you fly home. Spend a night at the Chateau Lake Louise, and, if you like to take pictures, think about getting up early to photograph the the sun rise, first on the glacier and then on the lake. This rail and drive package begins with an overnight stay in Vancouver on various dates from April 15 to October 10, 2019. Call 604-990-9299 or 1-800-913-9207 or Email us for more information and reservations. Prices depend on when you travel, number of travelers, and train service you choose. Prices can change based on hotel availability at the time of booking. Call 604-990-9299 or 1-800-913-9207 or Email for prices not listed below, for more information and for reservations. SilverLeaf Service – Reserved seating in a custom built single level car with expansive windows curving into the ceiling, hot breakfast and lunch served at your seat, as well as complimentary alcoholic and non-alcoholic beverages during the day. Alcoholic and non-alcoholic beverages are included on the train.